I might recall my excitement when the suburbs swung to Kevin Rudd on a fairness, equity and change platform in 2007. Rudd said he was no socialist, but spoke of the importance of social justice and reducing homelessness. He axed work-for-the dole and funded specific programs for job seekers in local communities. His government also created the somewhat improved Job Services Australia, while 'mutual obligation' and its often devastating 'non-compliance' penalties were significantly softened. In short, Rudd ushered in a revamped, though not revolutionary way of thinking about the welfare state — the Howard Government's approach was watered-down rather than turned on its head. Rudd also ushered in important symbolic and rhetorical change; 'dole bludgers' and 'job snobs' have now moved to the fringe of the lexicon. Symbolism can only go so far though, and it was a great shame that most of the unemployed missed out on stimulus payments equivalent to a whole month's salary. Julia Gillard came to power and provided a more specific message, telling the Sydney Institute that Labor was the 'party of work, not welfare'. Over time it dawned on me that Gillard, unlike her predecessor, has made no critique on neo-liberalism, the importance of social justice, poverty or homelessness. Now the ALP is about 'jobs and growth' and the 'Fair Go' — but 'fairness' says Gillard 'can only be funded through economic strength'. 'ALP values', Gillard has said, can only be achieved with 'new structural savings that will maintain the sustainability of the budget and make room for key Labor priorities'. This contention has proved only partially true, it seems Gillard's welfare policy style has been part cut and part thrust: carrots for industry, education providers and government departments, and sticks for the unemployed. Gillard has expanded the unemployment bureaucracy beyond recognition — her 'social democracy' is too-often narrowly framed by the economic and political interests of middle Australia. Her Government's record on welfare is fairly poor: she has refused to boost the Newstart Allowance, she made it much harder to qualify for the disability pension and for young people to get the dole, and cut single mother pensions. It also revived, extended or rebranded Howard Government welfare-for-work, work-for-the dole and income-management programs, and introduced retrospective legislation to crack down on 'welfare cheats' — although this was a law that the High Court would later rule invalid. 'Jobs not welfare' is fine in principle, but jobs remain hard to come by for many in our society. Indeed, we have a serious unemployment issue in the nation: 150,000 more people are unemployed now than before the GFC; since 2009 the number of long-term unemployed in Australia has risen by 50 per cent and youth unemployment is at levels not seen since the 1990s recession. A further 800,000 people remain involuntarily under-employed. All is not bleak. The Gillard Government's most successful and admirable policies for reducing unemployment is its commitment to developing workforce skills and linking them to Australia's burgeoning skills shortages — long-term thinking which should reap benefits in years to come. One particularly bright outcome is the number of people from disadvantaged communities who are now in higher education. Another successful but desperately under-funded scheme has been wage subsidies for employers to hire the disabled and long-term unemployed. 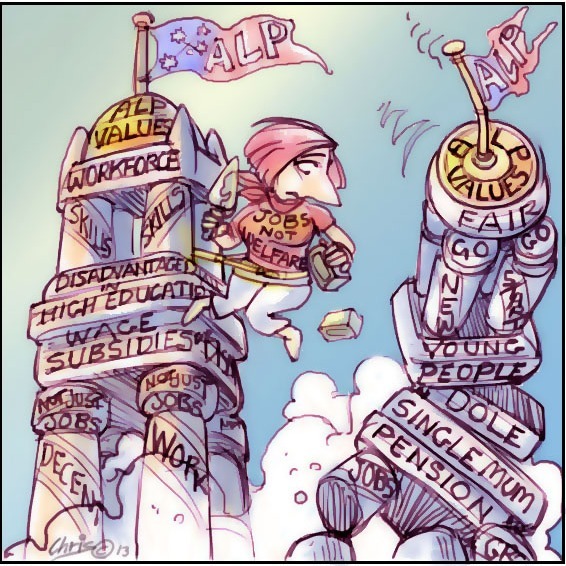 This skills commitment shows that the ALP values decent work, not just jobs; though in positing productivity as the path to prosperity the Gillard Government is certainly more Reagan than Keynes. Their key message seems to be that the market remains king. In this way, the ALP offers a tepid version of welfare policy already offered by the conservative parties; choice, responsibility and liberalism rather than equality, rights and justice, all tinged with pragmatism, mottos, realpolitik and the sense that nobody has yet conceived a viable alternative to neo-liberalism. Not that the Gillard government exemplifies this in any way, but "the market remains king" as against, say, "the market as peasant" is a pretty good predictor of societal welfare, if you take the deep historical view. Let's concede that anti-market North Korea v. market-as-king (relatively) South Korea is a highly embarrassing example for lefties, so we won't even go there (though, honestly, what do the anti-marketeers say about that mess. “They’ve just got the details wrong?” Yeah.). Take other historical examples, asking "what happens to the poor?". Well, to some degree or another, the market has been king in the West for the last 200 years. The result? A shift out of poverty for the vast masses in those countries that's been unprecedented in history. If Marx is right, that should correspond to huge quantities of wealth being stolen from some oppressed class. Who exactly were those oppressed? Were there unprecedented numbers of poor people on starvation wages, or just plain dying, in England – or even more so, in the U.S. - towards the end of the 19th Century? Nup. To the contrary, these were places that, unlike all historical precedents, did not know of deaths from famine. But let’s drill down to the micro. Resource-poor, but refugee-laden Hong Kong, 1950’s to 1990’s. The market was king in the most extreme sense imaginable to us. Result for the poor (and everyone else)? Growth rates and upward mobility from poverty that thrashed any other regime in the world. If you really do care about the poor, consider allowing the market to be king. To HH Your comment makes far more sense then the article by Luke. I am not a fan of Julia Gillard, but she is a not creating poverty traps like Rudd. Ironic, is it not, that we use an expression like "the market remains King" to describe the economic situation (let's called it neo-liberal) in a country like Australia which has a royal person as its impotent figurehead? In America, as far as I aware, they don't say "the market remains President". There is such a plethora of interacting variables that make up the economy that it very hard to see how any one person (Any dictator) or any one phenomenon (The market, religion, water)could be said to rule over it. We all seek a simple paradigm to explain the confusion of the history of man. Marx and Engels thought they had it in class struggle. The rising middle class struggled for control of society against the landowning class that held the reins (not reigns) of power under feudalism. The genius of Western democracy has been to find a mechanism that manipulates the needs and interests of men and women of a given economic class that leads them to believe that elected representatives can help satisfy their needs, nay even give them bigger and more expensive needs, and so advance the productive forces of society. It's all about satisfying appetites. market-solutions produce winners and losers. Rise in free-market capitalism resulted in massive inequality over the past 30 years all over the world. Check out the United States, market-based solutions have caused social decay. If the free-market works so well, why do we have such high levels of unemployment. Nth Korea has a over-sized size, a totalitarian state - their levels of poverty are about greed and fascism; it is an sign that a liberal democracy works not necessarily a free-market. The poorest nations on earth on all free-market economies. Gillard may have moderated the market, but neoliberalism is wearing thin and its time to think beyond that. "The poorest nations on earth on all free-market economies." Not on THIS planet earth, MG. Just compare the index of national per capita GDP and the index of economic freedom and you'll find that none of the 50 poorest nations is anywhere near a free market economy, and on the other hand the richest nations are mostly free market economies. Sprinkled among the latter are the Oil States which, when they're definitely not free in some significant ways, nevertheless always depend for their wealth totally on the existence of the free capitalist economies which value their oil. To reiterate: how come Hong Kong, one of the freest economies in all history for 50 years, with no natural resources and taking in thousands of refugees a year, didn't end up a basket case, but transformed itself nothing into the wealthiest per capita economy in the world? Unemployment? Well, why was the West Australia Bowes Basin gas project abandoned last week, spelling the end of job prospects for hundreds of workers, including local aboriginal groups keen for it to go ahead. Answer: Green tape and excessive demands from the Unions. Free markets eliminate unemployment. Anti-market groups like greens and unionists create it. Maybe our Chardonnay Marxist may open their eyes and look at situation where we can compare apples with apples. I mean, they should compare the Dominican Republic and Haiti. Here we have two countries with similar resources on the same island. One is reasonable well off and the other is one of poorest countries in the world. If we also look at the environmental management of both countries, then the differences remain as strong. Entry into the jobs market would be much easier if we abolished the minimum wage. Our insanely high minimum wage means that many people are unemployable, because their labour is incapable of being worth as much as the minimum wage. Such a step would require a transfer system, either on a negative income tax, earned income tax credit, or guaranteed minimum income model, but would get many more people into work and remove the distortions created by the minimum wage. The UK has a quite low minimum wage, and having lived on slightly more than that and found it a struggle, even though I was living in a share house, had no car, no debts, and no cigarette or drinking habits (admittedly I lived in London). I say you need a minimum wage that at least allows a decent standard of living. In England you have people working full time in quite responsible jobs that could never afford to move out of share houses. I'm sure this helps add to the numbers on welfare. On the bigger issues: I think doctrinal extremism has not worked for any economic theory. I would say economics and politics in our society are about finding what works, which usually turns out to be a mix of both rightist and leftist policies. And the same mix does not fit all, but needs to go further right or further left to suit the perceived needs of different groups, industries and times. We would all have loved an easy solution, but given that life doesn't seem to be like that maybe we should train ourselves to love becoming intimately aware of the complexities around us and admire those who are good at the game of getting the balances right (or close to)on a continually moving target. But Gavin, how does forcing an employer to pay someone more than their labour is worth help things? The usual response will be just not to employ anyone at all. If people need more income to live on that is a matter for the government to deal with, not the employer. Spot on, Adrian. The minimum wage is the enemy of employment. It's been proven to be so over and over again in history. Gavin, there aren't too many "extreme" capitalist regimes to pick from. By that I'm referring to regimes with are close to complete laissez-faire, not crony capitalist regimes in which the state acts coercively on behalf of selected businesses which are in effect anti-capitalist (eg, the Australian federal govt pouring billions of dollars into the pockets of big car companies.) But here are some regimes that are or were definitely much closer to laissez-faire capitalism in important ways than we are in Australia today: Hong Kong (1950s to 1996 at least), Singapore, Taiwan, South Korea, The U.S., overall, in the 19th century, Pennsylvania in the 1680s (for a few years entirely without government altogether, and yet it flourished in that time) Mauritius (by far the most economically prosperous country in Africa today). All of these "extreme" capitalist regimes are standouts in terms of extinguishing poverty. On the other hand I know of no extreme anti-capitalist regimes in which poverty isn't a problem. The verdict of history is clear: capitalism works, and the more you have of it, the further you'll get from that grinding poverty which characterized almost all of the experience of humanity up to the industrial revolution.